Ferroelectric perovskites hold promise of enhanced photovoltaic efficiency and photocatalytic activity. Under illumination, photoinduced carriers and photodissociated adsorbates disrupt the electrostatic screening and modify the switchable polarization. Here, we show that adsorbates enable a substantial modulation (up to 75%) of the switchable remanent polarization by light. Ferroelectric perovskites hold promise of enhanced photovoltaic efficiency and photocatalytic activity. Consequently, the photoresponse of oxide ferroelectric thin films is an active field of research. In electrode/ferroelectric/electrode devices, internal charge in the ferroelectric, free charge in the electrodes, and buried adsorbates at interfaces combine to screen the ferroelectric polarization and to stabilize the polar state. Under illumination, photoinduced carriers and photodissociated adsorbates may disrupt the screening equilibrium, modifying the switchable polarization and altering its expected benefits. Here, we explore the photoresponse of BaTiO3 thin films in a capacitor geometry, focusing on the effects of visible illumination on the remanent polarization. 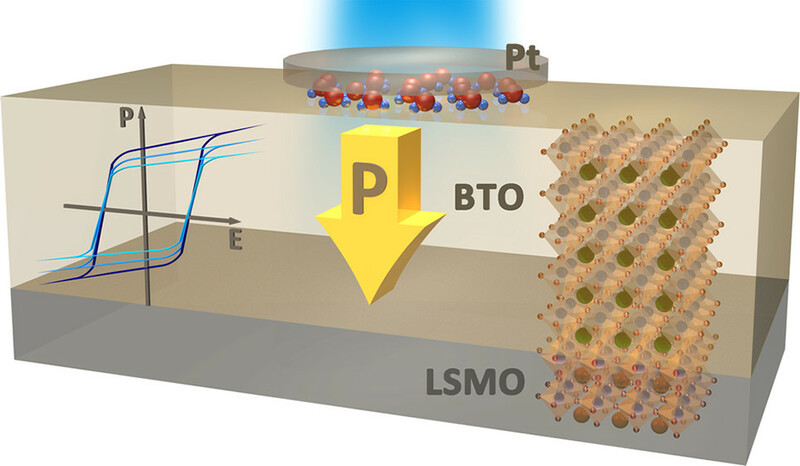 By combining ferroelectric and X-ray photoelectron spectroscopy, we discover that photoreaction of charge-screening H2O-derived adsorbates at the buried metal–ferroelectric Pt/BaTiO3 interface plays an unexpected pivotal role, enabling a substantial modulation (up to 75%) of the switchable remanent polarization by light. These findings illustrate that the synergy between photochemistry and photovoltaic activity at the surface of a ferroelectric material can be exploited to tune photoferroelectric activity.